is a precision machine shop specializing in short run production of custom manufactured parts. In this ever changing industry, we are committed to expanding and upgrading our equipment and process systems to stay current. OR fill out the contact form to the left of the page and we will get right back with you. Add your plans or drawings and any information we may need to make an accurate bid. Please take a moment to look over all that Lindsay Machine Works, Inc. can do to meet your manufacturing needs. 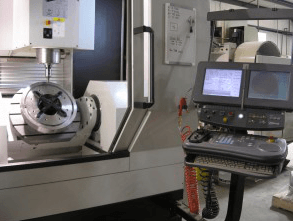 Capabilities include CNC machining (both milling and turning), manual machining (both milling and turning), CNC 4 and 5 axis vertical milling, water-jet machine cutting, horizontal boring, surface grinding, MIG, TIG and Stick welding and general welding fabrication. – This is not just our motto, it’s the very basis of how we do business. Lindsay Machine Works, Inc. believes no matter how quickly we deliver your part, or how competitive our pricing is- if we don’t deliver quality parts, in compliance with your specs, we risk losing our your business. Inspection is a critical part of our production process. In addition to the many hand held gauges, test kits, surface plates, test indicators, calipers, micrometers, and hardness testers, our Starrett Galileo AV350-QC5000 CNC vision and probe inspection system is in constant use. This system provides exceptional accuracy for a wide range of measuring applications and elevates our quality control program to a higher standard.